We offer Public Sails and Dockside Tours out of ports across Puget Sound during our sailing season from April through October. Our 3-hour Public Sails are designed to get everybody involved, and no sailing experience is required. From the moment we get under way you'll be invited to help raise the sails or take a turn at the wheel. As we explore the Puget Sound/Salish Sea, the crew will explain it's unique marine environment and share the history of Adventuress. Then listen maybe to a sea chantey, a talk from an on-board guest-- or just sit back and take in the whole experience. The cost for Public Sails is $65/adult and $35/youth (under 18). Sound Experience also offers a Membership option—$90 for an Individual or $140 Household of 4 Membership or a $160 household of more than 4 Membership that allows all those listed under the Membership to sail for free on up to 3 Public Sails for a 12-month period. In addition to those 3 free sails, Members also receive a discounted rate for guests: $45/adult and $25/youth (under 18)..
To sign up for an upcoming Public Sail, please check the schedule below and then click on the "BUY TICKETS" button. This will take you to the registration page. Be prepared to sign up with your name, email, phone number, address, and emergency contact information. Dockside Tours are free and open to the public and happen a few times a year. 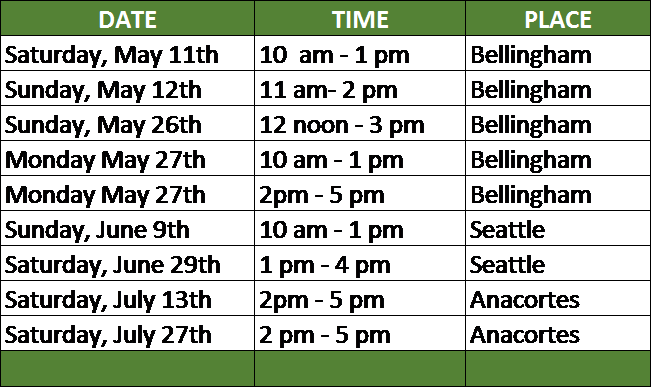 Check the schedule below for Dockside Tour dates and come down to the ship during that designated time and we will welcome you on board. Looking to join us for a Festival Sail this year? Come sail with us at the Port Townsend Wooden Boat Festival, September 6-8, 2019! To learn more about sail options during the festival and to purchase tickets, please visit our Festivals Page. *Please note Member Free Sails do not apply during the festival. 2019 Spring Public Sails are listed below. We will post additional dates throughout the season. We look forward to seeing you on board! To read more about what to expect on Public Sails, click here.